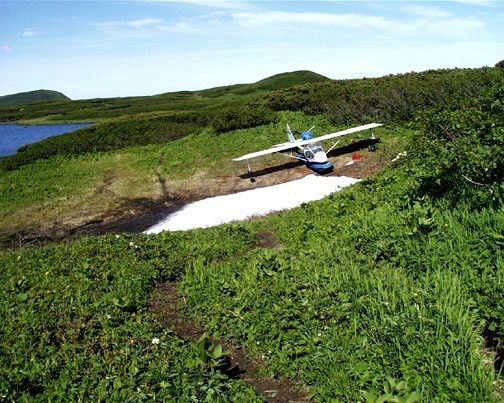 When Maureen and I first got the idea to go to Kamchatka to do a study about the possibility of learning to live with bears, it never occurred to me that there would the slimmest chance of being able to take my Kolb airplane and use it in Russia, even though I had originally built it for use in the wilderness and had, at the time, three years of unsupported flying experience, including the Spirit Bear project of Princess Royal Island. It was built in 1993. I had two difficult projects under my belt but flying in Russia seemed beyond any possibility that I could hope for. But it did happen and so far, touch wood, it's been very successful. I won't go into a lot of detail of what made it happen, because I do not know all the details myself, but I do know that there was a lot of luck involved and it also entailed bringing another Kolb Mark III kit as payment for our privileges of living in this incredible preserve for several years. 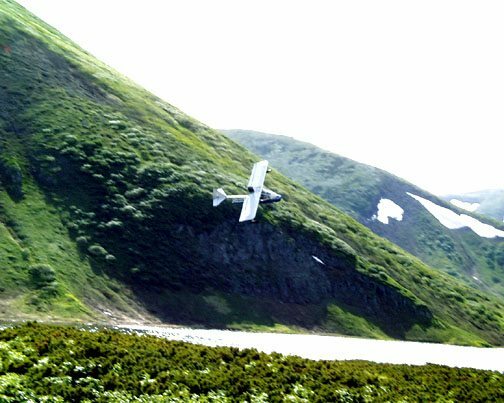 So there are two of these aircraft flying in Kamchatka. The other one has been flown rather tentatively so far. The real trick, of course, has been to keep it flying for the duration of the project. My only part support is in North America and we had no way of communicating with any one, as we had no radio or satellite phone until this year; (we started in 1996). We were virtually out of touch for five months each year. This meant that I had to bring with us everything that I anticipated needing each year and hope it covers my needs. I did anticipate a wreck of some kind like perhaps a bear ripping into it, so I have things like spare aluminum tubes, Dacron covering materials, rivets and basic tools, etc. We used everything last year when a 100 m.p.h. wind blew the plane over, causing a lot of damage. But with some concentrated work for three weeks, during which time no one figured out that we were in trouble, Maureen and I got it flying again. It actually flew a little better than it ever did previously, because I finally got a chance to tweak a few small things that I didn't get quite right when I built it. Some pilot friends and others, have asked , "when are you going to get a real plane?" and my stock answer is, when someone builds a "real plane" that does what I can do with this wonderful design. Like many others, I could not afford a regular air plane so I had to find one I could build and was determined to choose something, out of hundreds of kit home-builds on the market, that would do what I needed to do. It has become an interest of mine to demonstrate that these light home built planes can be serious flying machines, not only suited to recreation. Of course they all have to be flown with the same skill and thought that is required with all flying. I have only flown 210 hours in Kamchatka but factoring in the severity of the weather where our cabin is situated, this is not too bad. By far the greatest wear and tear on my Kolb is that caused by the wind while tied to the ground during storms but I am slowly learning how to reduce this with the use of a wind fence. I don't want to get thinking that I am a good pilot, for fear of getting cocky and killing myself, but I am surprised at what I can do with this plane at times. 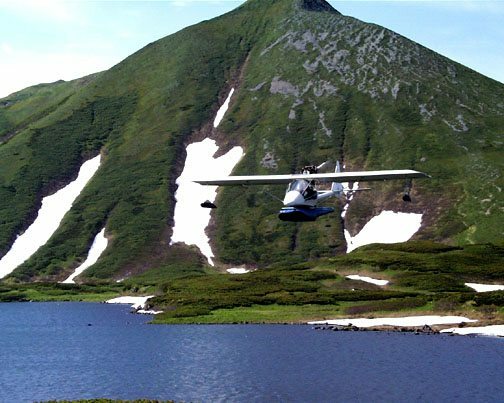 It is a lot like having a helicopter with all the possibilities for landing places with the float, even without the amphibious wheels, on water, snow and wet tundra. To survive while flying in the mountains you learn what air does while flowing around and over them and you have to know when to turn around when the weather turns against you. I have made a habit of carrying a sleeping bag and small tent with me at all times, so I can set down in a sheltered spot and wait for things to change back to the better. This, I have learned, can take a couple of days. Not (until lately) being allowed to use a radio made it worrisome for Maureen at times. Fog is a frequent visitor to our lake, which is on the west side of the divide, and it can pile in here from the Sea of Okhotsk real quickly. This all too often happens when I've flown to a place like our friends at the research station for some fresh vegetables where I can't watch what is happening while I am having tea. Coming back over the pass which separates the Kambalnoe area from the rest of Kamchatka, I am greeted with the dreaded fog but I have learned not to turn back before checking one thing first: it is usually clear on the east side so I fly along the divide to look for the "hole" which, I have learned, is a place where the top of the fog is pushed down so I can often see the south end of the lake. The problem is that it is caused by a down draft over a mountain and it is often small, so I have to put down full flaps and make a tight spiral. When I enter, it's like getting into a fast elevator and the trick was how to get out of it without slamming into the lake. I plan it so the spiral brings me around to the place where the air bounces off the lake. This acts like a big cushion and my sudden descent is pleasantly slowed and I touch down and taxi to the cabin on a compass heading though thick fog, to Maureen's great surprise! When I reverse this procedure, which is more difficult because you sit in the fog and guess when the hole might be there, I need all 80 h.p. to climb out in the down draft. Flying here has been a great adventure and I plan to cap the experience by eventually flying the Kolb from here back to Alberta via the Bering Straight. The plane is a Kolb Mark III which I built in three months, under pressure, start to finish, for the Spirit Bear project. The float is a Mono 2000, made by FullLotus in Vancouver B.C., Can. Gas consumption averages 2.7 U.S. gal./hr. I sometimes wonder if any one else has ever flown a aircraft, of any kind, for so long in the wilderness with no support?